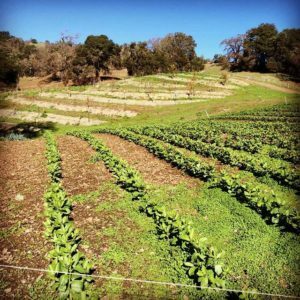 Mendocino Organics is owned and operated by Adam and Paula Gaska, a husband-and-wife farming team dedicated to environmental stewardship. 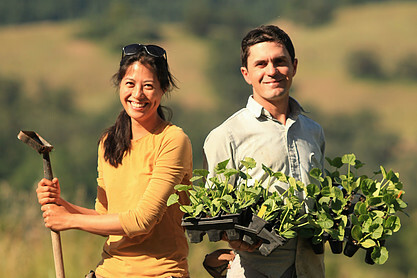 The Gaskas have been farming together since 2008. 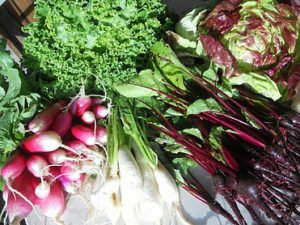 They grow a variety of mixed spring and summer row crops integrated with pasture-raised cattle, sheep, pigs and poultry. Adam and Paula lease acreage in Potter Valley, Ukiah, as well as two acres at Heart Arrow Ranch in Mendocino, where they grow apples, berries, figs, pomegranates, pears, and table grapes. Mendocino Organics planted fifty fruit trees in 2009 and another 350 fruit trees in 2012. When the Gaskas first started farming, land access and startup capital were the main hurdles to overcome. Once they found land to lease, Adam and Paula wanted to diversify their operation beyond the vineyard, however, there are no water restrictions in Mendicino County, and over-allocation is a problem. Emergency drought measures imposed by the State Water Resources Control Board require measuring and reporting water diversions, and the Board has the option of imposing a six-week diversion limit between November and May. The farm has ponds from which they can draw water, but eventually the Gaskas will need a water license, which could take years. An additional challenge is a south-facing slope with an erosion-prone 30-degree slope and poor fertility. Without a license, the Gaskas don’t have access to pumped water October through May. To address their water supply constraints, Adam and Paula constructed a passive diversion system by installing concrete weirs that mimic natural drainage. They pull boards in the weirs to fill their ponds, usually beginning in January, and then close them when the ponds are full, usually in March. They draw irrigation water from the ponds when they are unable to pull water from the groundwater basin. All of the water in the system is captured rainfall. Another pond was installed at the ranch, so now all irrigation water is from an on-site pond. To combat seasonal runoff, the roads on the property have been engineered to redirect sediment to a ditch. Heart Arrow Ranch is situated atop a ridge that feeds into the Russian River, so the Gaskas voluntarily opt to not divert water during the first rains so that the rainwater can push silt out of the way, which encourages salmon to spawn. They installed swales and sediment catchments to facilitate the spread of rainwater across the landscape, and put down straw mulching to maintain soil moisture content. The Natural Resources Conservation District worked with Mendocino Organics to terrace the problematic hillside and level high slopes. The Gaskas installed soil berms, which control erosion and sedimentation by reducing the rate of surface runoff and minimizing the adverse effects on exposed topsoil. They protect the topsoil in the orchard is protected by planting cover crops, which also stimulate water infiltration and boost soil fertility. They placed weather satellite centers around the ranch to measure temperature, wind, and humidity to inform irrigation practices. The stations are maintained by Farmecology Labs, whose Adcon system combines the use of soil moisture monitoring probes or C-Prob rods, which are placed four inches deep in the soil. The Gaskas use data from the probes to inform irrigation decisions. Finally, the Gaskas strive to reduce off-farm inputs and use livestock manure to create a closed-loop fertility cycle. The farm’s irrigation and nutrient management plan has been refined by trial and error over the course of five years. Precision irrigation saves water and energy, and Adam has found that consistent monitoring makes a significant difference. Based on soil tests and petiole analysis, the Gaskas modified their soil fertility methods and added more lime and compost. Once, while experimenting with the soil moisture probes, the Gaskas accidentally under-irrigated, causing irreversible crop damage. Adam conducted more research online and found that he needed to irrigate more precisely for the intense summer heat of the region. Each year, for a fee, an Adcon technician visits the farm and maintains the server that stores the online data. Once, the technician advised the Gaskas to do more monitoring, update their satellites, and replace non-working probes. This process motivated them to switch from hand watering to micro-sprinkler irrigation in the orchards. The farm’s five on-site ponds provide habitat for migrating waterfowl and offer sixty-five acre-feet of water storage. Irrigation scheduling has led to a 30-40 percent reduction in the Gaskas on-farm water use. Consistent irrigation has also produced higher crop yields and healthier plants that are more resistant to insect pressure. The Gaskas purchase 100 percent of their pig feed from food manufacturing sources (e.g whey and grain) and each year they divert 350 tons of food waste from the landfill. Lastly, the NRCS assisted them with the establishment of 200 feet of native hedgerows to improve pollination in the orchard.